Spanish Meatballs, or Albondigas, are traditionally served at tapas bars in Spain. Whether you serve them for an appetizer, tapas party, or dinner main dish, these small meatballs in a flavorful tomato sauce are perfect for enjoying with a glass of Spanish red wine. Albondigas (or albondiguillas) is the name for Spanish meatballs. And while you may not find them gracing a dinner table, they are still commonly found around Spain, just a little earlier. In Spain, it is common to eat dinner extremely late: like 10pm or later. 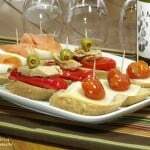 So, to tide them over until meal time, it is common to go out with friends for after work snacks and drinks, called tapas. Tapas are small portions that are meant to be shared as something to nibble on while you’re catching up and chatting about the day. 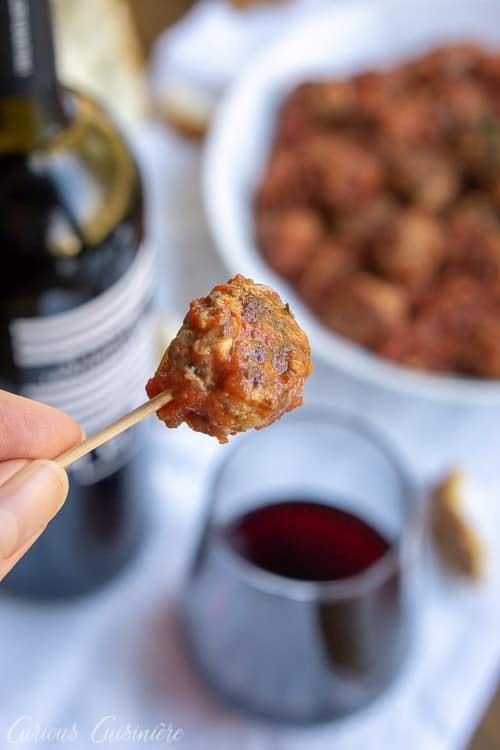 Albondigas, meatballs in tomato sauce, are a perfect one-bite nibble that you will find in many taps bars. 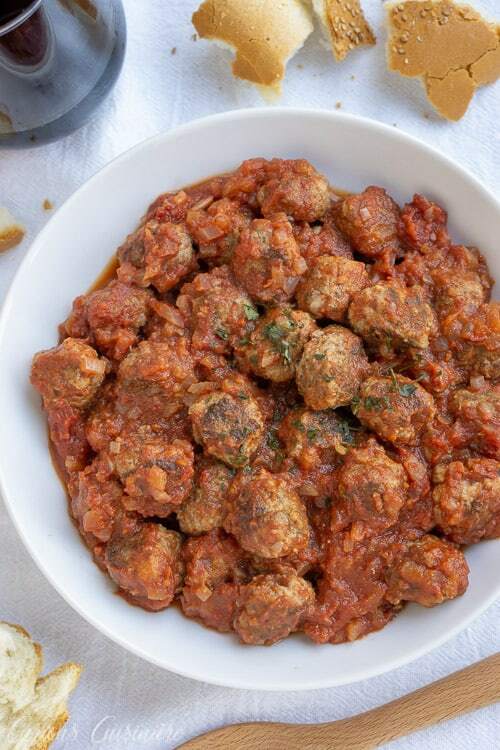 The biggest difference between Spanish meatballs and Italian meatballs is their size. Spanish meatballs are small, only about an inch in diameter. Remember, these are an appetizer after all! 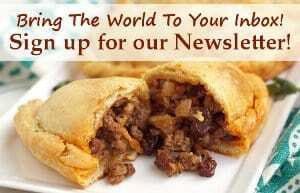 Spanish meatballs are traditionally made with pork, veal, or beef, or any mixture of the three. 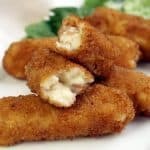 They are pan-fried before being simmered in the sauce, which really infuses these little guys with lots of great flavor. As far as seasonings, just like Italian meatballs, the seasonings in Spanish meatballs can vary depending on the chef. Most commonly though, Spanish meatballs are seasoned minimally, which really lets the flavors of the sauce shine through. For our version of albondigas, we used a combination of beef and pork. 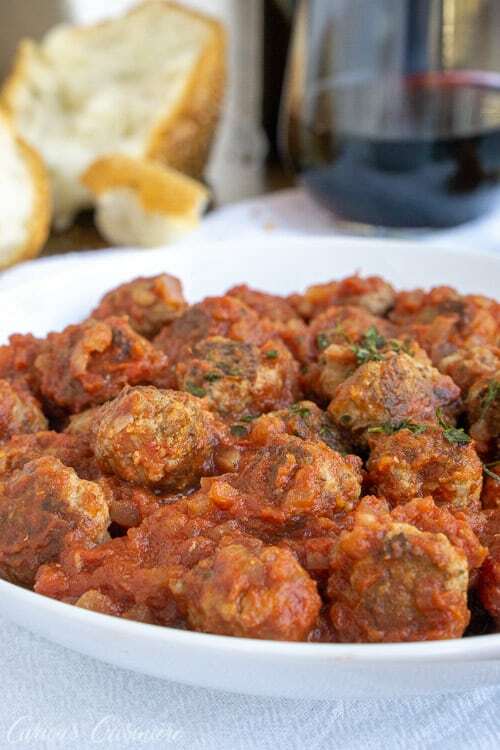 We love the way the pork adds juiciness and the beef adds depth of flavor to the meatballs. It’s such a wining combination! We also used soaked pieces of torn white bread in our meatballs. The soaked bread adds a nice, springy texture to these meatballs, making them incredibly addicting. We’re typically not huge fans of frying our meatballs, we find it’s much easier to bake meatballs, that way you don’t have to worry about cooking them in batches and creating flat sides to your round meatballs. But, the small size of these Spanish meatballs made them much easier to pan fry. In addition, you’re just frying them to get a nice golden brown crust on the outside. They don’t need to be cooked all the way through, since they will be cooking while they simmer in the sauce. And, let’s talk about this sauce for a minute. It’s so simple, but the wine and the paprika give it a robustness and light, almost fruity sweetness that we fell in love with. 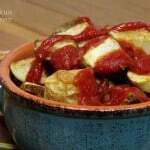 This is definitely not your typical Italian red sauce! While you’re making these meatballs, why not throw an all-out tapas party? 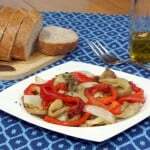 Here are some more Spanish tapas recipes to fill out your spread. No tapas dish would be complete without talking about some wine! We were fortunate to receive some samples of wine from the Navarra region in the north of Spain. One of the bottles that we received was an Altos de Inurrieta from Bodega Inurrieta winery. This wine is a blend of 40% Cabernet Sauvignon, 30% Syrah, and 30% Graciano. 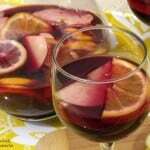 It is a deep and luscious color, that looks so pretty in the glass. What we found was that this wine definitely needs a good 30 minutes of decanting to really open up. Once it has had time to open, this wine that has a lot of red fruit and leather on the nose, brings a beautiful balance on the palate. It has a nice dryness on the front-end that opens up into a generous acidity on the back-end, ending in a very silky finish. For flavors, we notices notes of cherry and raspberry, along with a hint of vanilla. We were a bit nervous at first about pairing this wine with tomatoes, since we weren’t sure if there was enough acidity in the wine to hold up to the acidity of the tomatoes, but after we let the wine open up, we were wonderfully surprised by the pairing. Using a red wine in the tomato sauce really helps to bring this pairing together. 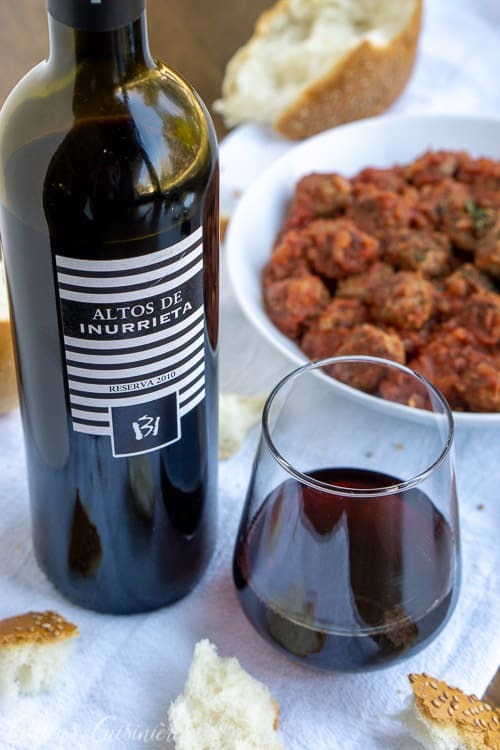 It smooths out the bright acidity from the tomatoes, and what acidity is left in the sauce helps to smooth out the dry front edges of each sip of the Altos de Inurrieta. Each sip of wine washes your palate clean and readies your for another bite of your tapas meatballs. In turn, the meatballs call out for a sip of wine to bring everything full circle. This definitely is a perfect tapas-time pairing! In a small sauté pan, heat ½ Tbsp oil over medium heat. Add the onion and garlic. Sauté until softened, 3-5 minutes. Set aside to cool. Place the torn bread in a small bowl and pour the stock over it. Let the bread soak up the stock for 2-3 minutes. In a medium bowl, combine the ground pork, ground beef, egg, grated cheese, parsley, salt, and pepper. Add the cooled onion mixture and soaked bread. Using a large fork or your hands, mix the ingredients until evenly combined. Heat the remaining oil in a large sauté pan over medium high heat. 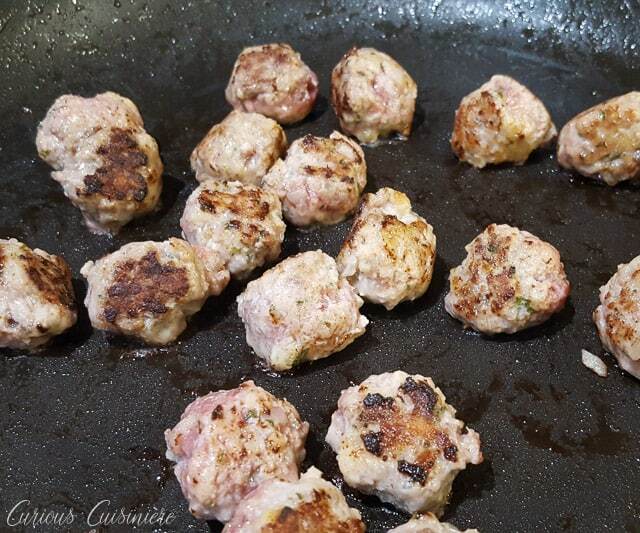 Continue cooking the meatballs in batches until all your meat mixture has been used. Once all your meatballs have been browned, add a little oil to the sauté pan, if needed. Heat the oil over medium high heat and add the minced onion for the sauce. Sauté the onion until softened, 3-5 minutes. Add the crushed tomatoes, beef stock, wine, paprika, and salt. Mix well and bring the sauce to a simmer. Add the meatballs and reduce the heat to medium low. Simmer the meatballs and sauce for 20 minutes, until the meatballs are cooked and the sauce is thick. 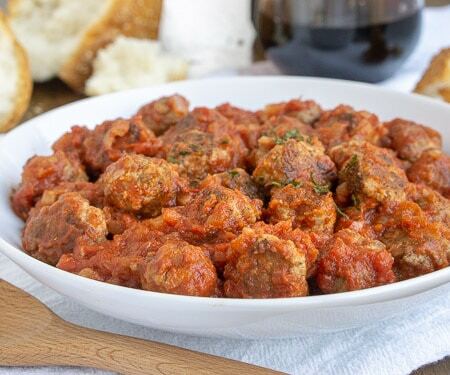 Serve the meatballs with crusty bread and a glass of red wine. I made these with ground Turkey. I wanted more Spanish flavor so I added cilantro,, 1 teaspoon chopped jalapeno and cumin and doubled the other spices since ground Turkey can be kinda bland. 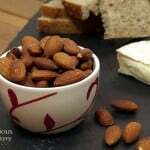 I also wanted to make a meal out of em so I served them over medium sized whole wheat shells. Delish! Muchas gracias!! Sounds delicious! Thanks for sharing your adaptations! Hi Sarah, my husband made this recipe for our Christmas tapas, and I think they were the best meatballs I’ve ever had…so tasty! But quite a few of the meatballs pretty much disintegrated …..any suggestions to help them keep their shape? Hi Deb! Thank you! With the amount of bread in these meatballs, they tend to be a bit more fragile. Yours disintegrating likely has to do with the type of bread you used. It’s hard to say, since each type of white bread will absorb a different amount of liquid. We will re-test these soon and see if there are any adjustments or clarifications in the recipe that we can make to help them keep their shape better. Thank you for your notes! So glad you enjoyed the sauce! 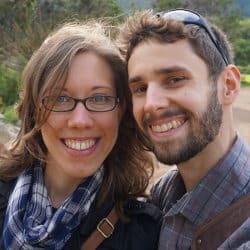 Thanks for sharing how you made it! 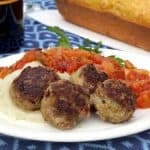 I love meatballs and can’t wait to try these!!! I can already picture myself eating these with a glass of Navarra wine. Cheers!